The Gull Parallel Wire System is an alternative to a roof net for gulls and uses similar brackets and the same tensioned perimeter straining wire as the net installation. The system uses orange nylon coated wire spaced at about 400m centres which is visible to the gulls and stops them from landing by contact with their wings. While all pest bird species can be annoying, gulls are perhaps the worst culprits of all. Not only are they incredibly intelligent, but they are particularly stubborn creatures. Whether they have nested on your roof and are guarding their eggs, or merely like to roost in the one spot, you will likely find it extremely difficult to shift these gulls once they have settled in. Not only do gulls cause a lot of bother by fouling all over the building, but they can also become quite aggressive when they are guarding their eggs and chicks. 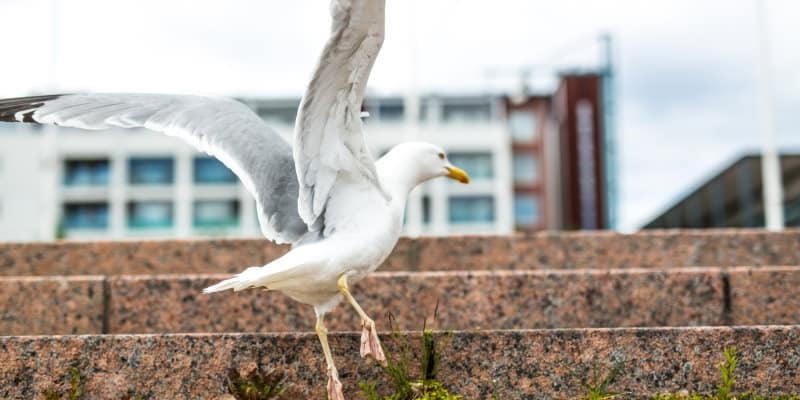 Due to the way their eyes work, gulls have poor depth perception, so even though they are several storeys up, they will see people on the ground as just a few metres away and swoop down to protect their young from the perceived threat. The only real option is to stop them from landing in the first place- and gull wire systems are extremely effective at doing just that. Gull wire systems work by using nylon-coated wire, typically coloured orange so that the gulls can clearly see them. The wires are spaced so that they are slightly narrower than the birds’ wingspan. This makes it extremely difficult for them to land and take off properly, so the gulls will quickly give up and move on to another area. Traditional bird wire systems would entangle the birds and trap them, but our advanced gull wire merely keeps them from landing in the first place. Many of our customers choose gull parallel wire systems because they are a more discrete option than nets. This makes them the ideal choice where the appearance of the net on a roof might be a concern. What’s more, a gull wire system also makes it easier for people to access the roof for maintenance, as it is possible to walk between the wires. This type of system is also less susceptible to damage in high winds than a large roof net. At Pest Solutions, we pride ourselves on providing some of the most advanced pest control solutions on the market today. We only ever use high-quality gull wire that delivers the optimal results, so you can be sure that our pest bird control service will deliver the results that you need. To show you what we can do, we are delighted to offer a completely free, no-obligation survey to anyone interested in our services. One of our expert pest control technicians will be happy to come out to your property and assess the issue at hand, before coming up with a solution that’s perfectly adapted to suit your unique needs. There’s no need to let a gull problem take over your property. Instead, call in the experts at Pest Solutions, and let us come up with the ideal pest control solution for you. Pest Solutions carry out all aspects of pest bird control throughout the UK. We can provide and install all aspects of the gull parallel wire system and also offer a wide range of other pest bird deterrent systems. You can be sure that Pest Solutions will deliver the right solution to all your pest control problems and ensure that gulls stay well away from your ledges, rooftops, and more. Contact us today, as see for yourself why so many customers come back to us time and again. Pest Solutions has regional branches across the whole of the United Kingdom, meaning we can quickly respond to any and all enquiries. Our professional technicians are always on hand to help with your pest infestation problems, whether it’s gull parallel wire systems or any other solution. Call now to get an experienced Pest technician visit and get that Pest problem under control swiftly. Find your local Pest Solutions branch here, or call 0800 027 2555 today for a FREE survey or to arrange a service technician visit.